The ready event occurs after the HTML document has been loaded, while the onload event occurs later, when all content (e.g. images) also has been loaded. The onload event is a standard event in the DOM, while the ready event is specific to jQuery. The purpose of the ready event is that it should occur as early as possible after the document has loaded, so that code that adds functionality to the elements in the page doesn't have to wait for all content to load. $(document).ready() is a jQuery event. JQuery’s $(document).ready() method gets called as soon as the DOM is ready (which means that the browser has parsed the HTML and built the DOM tree). This allows you to run code as soon as the document is ready to be manipulated. It will not wait for the images to be loaded. Replace $ with jQuery when you receive "$ is not defined." Not used if you want to manipulate images. Use $(window).load() instead. jQuery $document.ready function event executes a bit earlier than window.onload and is called once the DOM(Document object model) is loaded on your page. It will not wait for the images, frames to get fully load. A word of caution on using $(document).ready() with Internet Explorer. If an HTTP request is interrupted before the entire document is loaded (for example, while a page is streaming to the browser, another link is clicked) IE will trigger the $(document).ready event. $(document).on('ready', handler) binds to the ready event from jQuery. The handler is called when the DOM is loaded. Assets like images maybe still are missing. It will never be called if the document is ready at the time of binding. jQuery uses the DOMContentLoaded-Event for that, emulating it if not available. $(document).on('load', handler) is an event that will be fired once all resources are loaded from the server. Images are loaded now. 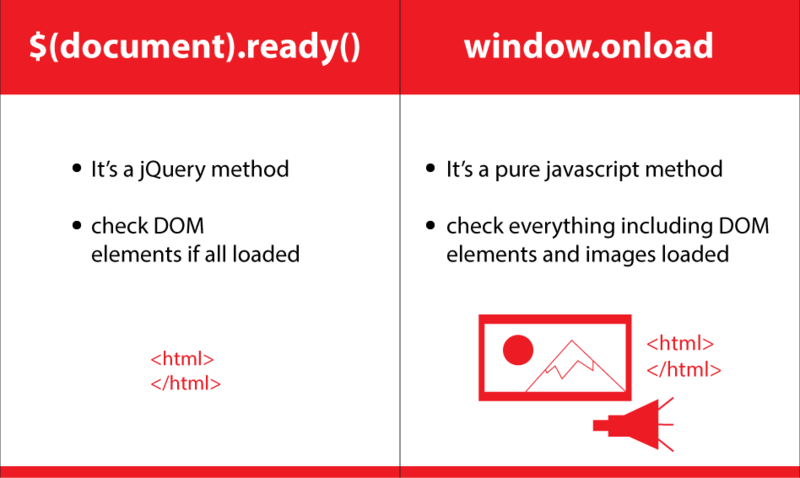 While onload is a raw HTML event, ready is built by jQuery. $(document).ready(handler) actually is a promise. The handler will be called immediately if document is ready at the time of calling. Otherwise it binds to the ready-Event. Before jQuery 1.8, $(document).load(handler) existed as an alias to $(document).on('load',handler). document.ready: A specific jQuery event when the entire HTML have been loaded. The $(document).ready() is a jQuery event which occurs when the HTML document has been fully loaded, while the window.onload event occurs later, when everything including images on the page loaded. // Catch cases where $(document).ready() is called after the browser event has already occurred. The window.load however will wait for the page to be fully loaded. This includes inner frames, images, etc. Always use the window.addEventListener to add an event to window. Because that way you can execute the code in different event handlers . alert('Hello!') // it will not work!!! This is because onload is just property of the object, which is overwritten. By analogy with addEventListener, it is better to use $(document).ready() rather than onload. One thing to remember (or should I say recall) is that you cannot stack onloads like you can with ready. In other words, jQuery magic allows multiple readys on the same page, but you can't do that with onload. The last onload will overrule any previous onloads. The document.ready event occurs when the HTML document has been loaded, and the window.onload event occurs always later, when all content (images, etc) has been loaded. You can use the document.ready event if you want to intervene "early" in the rendering process, without waiting for the images to load. If you need the images (or any other "content") ready before your script "does something", you need to wait until window.onload. For instance, if you are implementing a "Slide Show" pattern, and you need to perform calculations based on image sizes, you may want to wait until window.onload. Otherwise, you might experience some random problems, depending on how fast the images will get loaded. Your script would be running concurrently with the thread that loads images. If your script is long enough, or the server is fast enough, you may not notice a problem, if images happen to arrive in time. But the safest practice would be allowing for images to get loaded. document.ready could be a nice event for you to show some "loading..." sign to users, and upon window.onload, you can complete any scripting that needed resources loaded, and then finally remove the "Loading..." sign. get the object document and push it, since it's not in local scope, it must do a hash table lookup to find where document is, fortunately document is globally bound so it is a single lookup. find the object $ and select it, since it's not in local scope, it must do a hash table lookup, which may or may not have collisions. find the object f in global scope, which is another hash table lookup, or push function object and initialize it. call ready of selected object, which involves another hash table lookup into the selected object to find the method and invoke it. In the best case, this is 2 hash table lookups, but that's ignoring the heavy work done by jQuery, where $ is the kitchen sink of all possible inputs to jQuery, so another map is likely there to dispatch the query to correct handler. function object is pushed on the operand stack. check if onload is a property or not by doing a hash table lookup, since it is, it is called like a function. In the best case, this costs a single hash table lookup, which is necessary because onload must be fetched. do dynamic dispatch of jquery like we do today. copy the result of 2 directly into your code, and skip the cost of eval. Jquery. What is the difference between these functions $(document).ready and $(window).load? window.load for all dom manipulation with jQuery? JQuery - Which event gets triggered first window.load or document.ready?